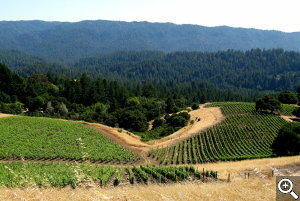 Welcome to the Spring 2010 newsletter from Rhys Vineyards! This offer contains our most highly acclaimed Pinot Noirs from the fantastic 2007 vintage. 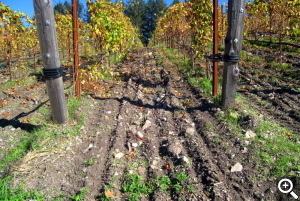 A view of the lower vineyard blocks at Horseshoe Ranch. The 2007 growing season in California was ideal. It began with a very dry Spring and the resulting dry soil conditions severely limited yields and created small clusters comprised of tiny grapes with thick skins. These characteristics set the stage for wines of great intensity. After flowering in late May and early June, the mild summer weather and cool harvest conditions allowed the grapes to ripen slowly and evenly without excessive sugar accumulation. The resulting wines exhibit intense flavors, great precision, low alcohol and exceptional balance. They are also quite structured. Please note that our 2007 Pinot Noirs, and particularly the wines featured in this release, will require more cellar time than other recent vintages. 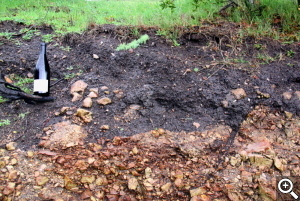 Horseshoe’s shallow soils are rocky and well drained. 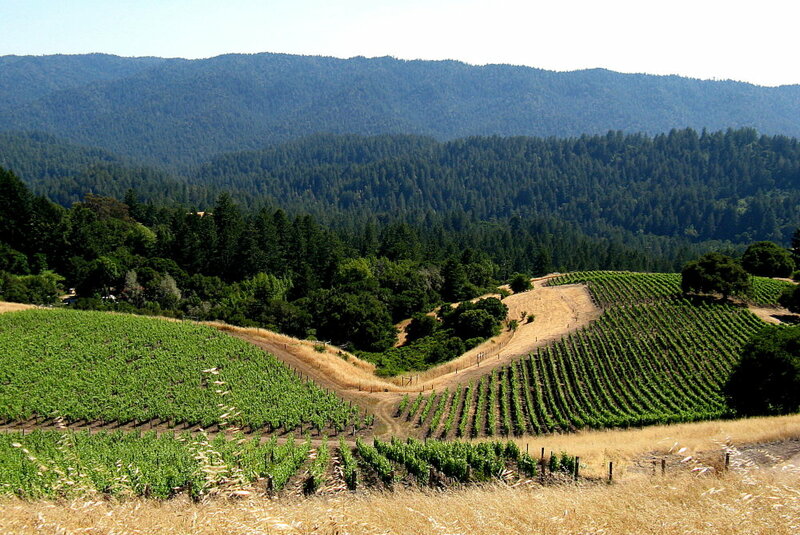 In addition to being Rhys’ most beautiful property, Horseshoe Ranch is also our most ideal site for growing great Pinot Noir. Located just 500 yards due east of Alpine vineyard, Horseshoe shares Alpine’s cool, altitude-influenced marine climate. However the similarities end there. Horseshoe Ranch has very different soil, geology, slope and aspect. Its more gentle slopes are comprised of shallow clay loam topsoil covering a bed of deeply fractured rock called Monterey Shale. This combination produces grapevines that find the perfect balance of sustenance and struggle. After analyzing wines made from hundreds of combinations of climate and soil, it has become apparent to us that the natural vine balance provided by shallow rocky soils is the key to producing balanced wines featuring intense fruit, good acidity and low alcohol. 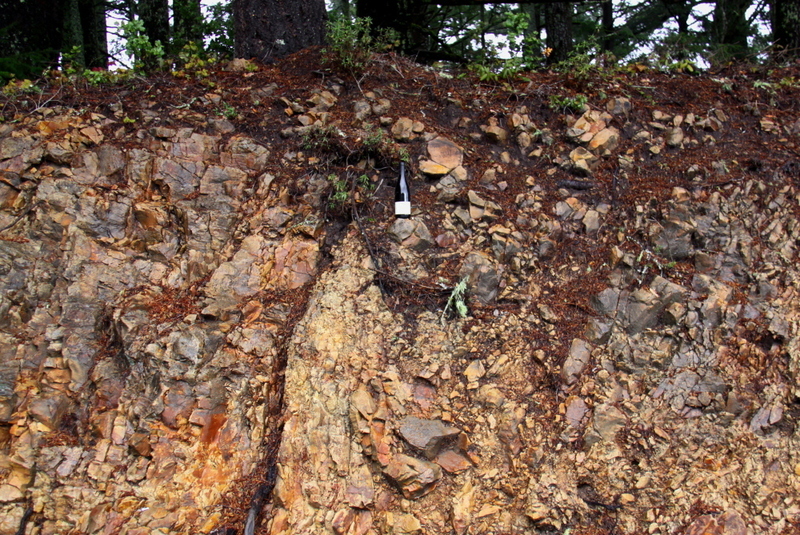 Additionally, these rocky soils allow grapevines to express the complexity and sophistication that differentiates truly great wines from the ordinary. Whether the variety is Syrah, Chardonnay or Pinot Noir, the wines from Horseshoe are intense, reticent and subtle. There is a slight family resemblance to Alpine Vineyard, but Horseshoe produces wines that are more introverted and less flamboyant, yet equally complex with sophisticated mineral driven aromatics. 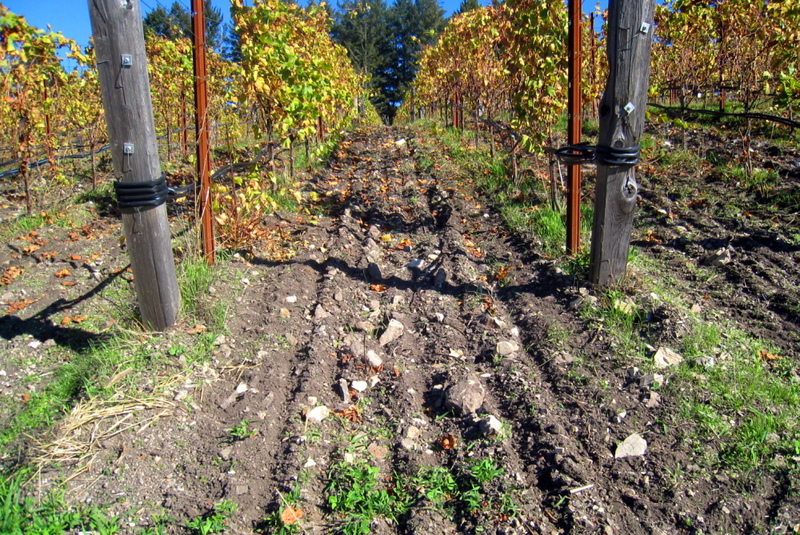 While the 2007 Horseshoe Pinot Noir is quite limited, production is increasing steadily as the vineyard matures. With the 2009 vintage, it has become our largest bottling and one of our very highest quality Pinot Noirs. Later this year, we will offer the 2007 Horseshoe Syrah and the first vintage of Horseshoe Chardonnay will be 2009. 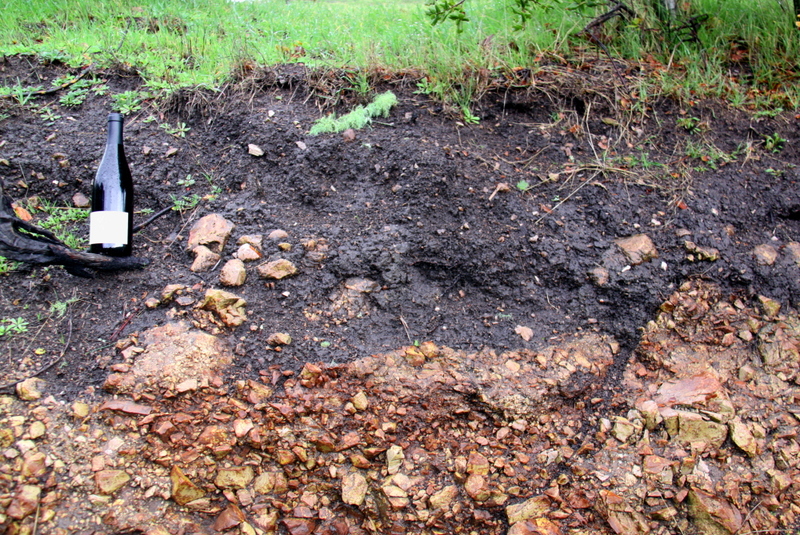 Horseshoe Ranch has a clearly defined 12-24 inch layer of topsoil over fractured Monterey Shale. All Rhys wines are made with the intention that they will improve with cellar time. Our rocky, mountainous sites produce wines of great intensity and, like Burgundies from great vintages, these wines really need time in the cellar to show the more complex and balanced side of their personalities. Additionally, our hands-off winemaking approach limits exposure to oxygen prior to bottling. This means that Rhys wines open and evolve very positively with air. Even our oldest wines (2004s) still improve quite dramatically with an hour in the decanter. In order to help our customers, we have a page on our website devoted to drinking recommendations for all of our wines. To access our drinking advice chart, please click here. 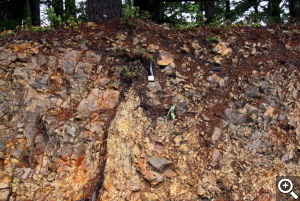 The Monterey shale is quite fractured which allows deep root penetration into the rock strata. Notice the tree root descending from the bottle to the bottom of the picture. Our Fall 2010 release will focus on the first wines from the 2008 vintage. While this vintage was extremely challenging, particularly when compared with the idyllic 2007 vintage, it has produced many of our finest estate wines to date. Quantities will be similar to 2007 with the exception of Horseshoe Pinot Noir which will be similar in size and allocation to our Family Farm and Alpine bottlings. In addition to the very successful estate Pinots, we will have excellent availability of our 2008 Alesia Sonoma Coast Pinot Noir. Sadly, this will be our last Alesia bottling. As our five Santa Cruz Mountain estate vineyards have reached full production, we have come to realize that they demand and deserve our complete focus and attention. This means that starting with the 2009 vintage all of our wine will be produced exclusively from Rhys’ estate vineyards and will be labeled as Rhys. Many customers have wondered if our overall production level might be increasing at Rhys. In reality, production declined over 2007 and 2008 and only returned to 2006 levels with the 2009 vintage. To be clear, our goal at Rhys is to make small amounts of the very best wine possible and we do not expect to see a meaningful increase in production beyond the 2009 levels until our new plantings at Bearwallow vineyard mature around 2013. Unfortunately the 2007 Horseshoe, Swan Terrace and Alpine Hillside Pinots are extremely limited. If you are not allocated the quantity of wine that you would like, please remember to fill out the Additional Quantities section of the order page on our website. Our guaranteed ordering period requires that we undersell our wines, which means that we are often able to fill these requests for additional bottles. As usual, all wines are offered with free UPS ground shipping. In addition, we will be opening the winery (at 936 Bransten in San Carlos) for a pick-up day on March 13th. Please stop by and sample some of our 2008 wines! Also, if you would like to pick up your wine, please choose the “Hold for pick up” shipping option on our website when you place your order.